Blueberry, strawberry, or raspberry chia pudding made with almond milk is an easy make-ahead overnight breakfast that tastes like dessert. This chia pudding recipe is packed with nutrition to fuel your day. For awhile I was really good about prepping chia pudding before bed and having a super nutritious breakfast in the morning. Somehow got out of the habit and nearly forgot about my old friend chia pudding. I’ve posted about chia pudding in the past. You might remember my basic How to Make Chia Pudding post or my dreamy Chocolate Chia Pudding. I recently switched things up and started making berry chia puddings. I’ve tried making berry chia pudding a few different ways. In the past I had simply mashed fresh berries into the chia pudding. I love cooking berries down into a sauce. You might remember I did that with my Quinoa Superfood Breakfast Bowls. The great thing about cooking berries down into a sauce is that it intensifies the flavor and makes the berries even sweeter. You can use fresh or frozen berries, and it takes just a few minutes. 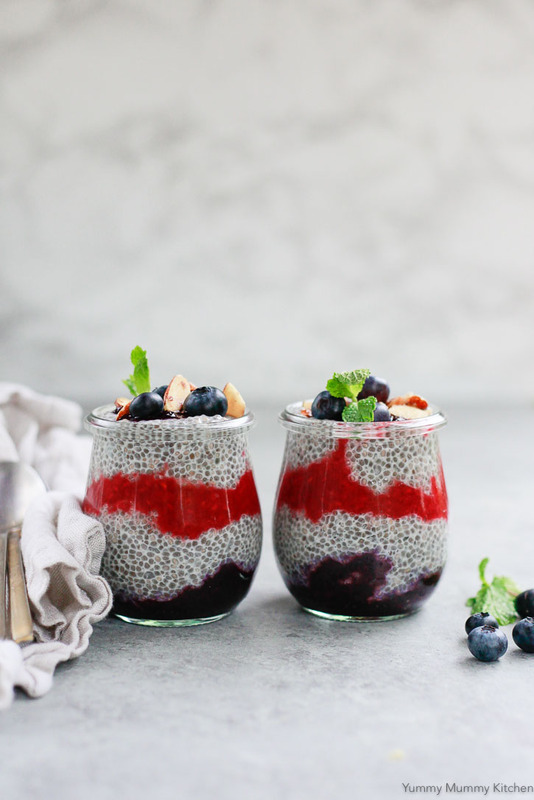 This berry chia pudding starts out just like ordinary chia pudding. Chia seeds and milk (I use almond or coconut milk) get swirled together. Let them mingle together for about 10 minutes and then stir again. When I’m in a rush I skip this step, but the chia seeds tend to sink to the bottom, and giving a second stir before refrigerating helps. I use unsweetened vanilla almond milk and then sweeten to taste, usually with a few drops of organic liquid stevia or a splash of maple syrup. If you’re not yet a chia-devotee, let me get you up to speed! Chia seeds aren’t some new hippie food. It’s said that chia was used by the Aztecs as far back as 3500 B.C. When I was training for a half marathon a few years ago I read a book called Born to Run, which is based on the Tarahumara tribe, “the running people.” The Tarahumara would run 50-100 miles at a time, seemingly with ease and just for the fun of it. One of their dietary staples was chia seeds. 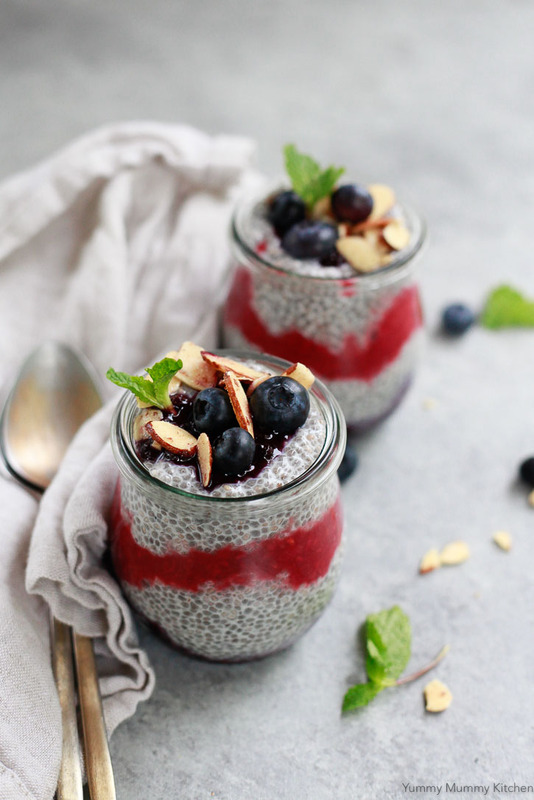 I’ve also heard chia seeds referred to as “ancient Aztec running food.” I myself do feel more more energized and satiated when I have chia pudding with berries for breakfast. Though I’m no Tarahumara runner, I find chia pudding to be great fuel for my morning workouts. Chia seeds are a complete protein, and good plant-based source of essential fatty acids and fiber. Chia seeds were also a pantry staple for the Native Americans where I live, the Chumash. It makes me so happy to see these little jars of nourishment in the fridge in the morning. I always like to add some crunch to my chia pudding before eating. Granola or nuts work well. This time I used sliced toasted almonds and few fresh blueberries. The berry sauces can be swirled into the pudding in bowls, or layered like parfaits. 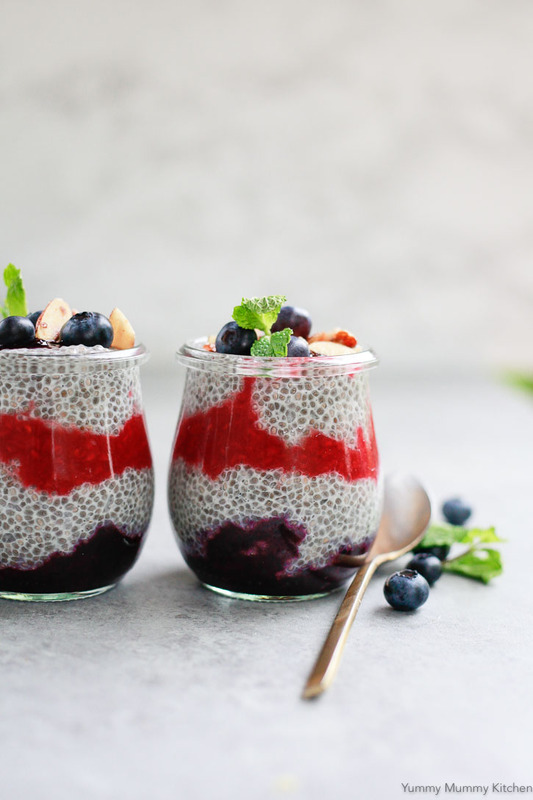 I like to make little layered berry chia pudding jars to keep in the refrigerator for a couple of days. I made a 60 second video so you can see how easy it is to make your own cute little berry chia pudding cups! 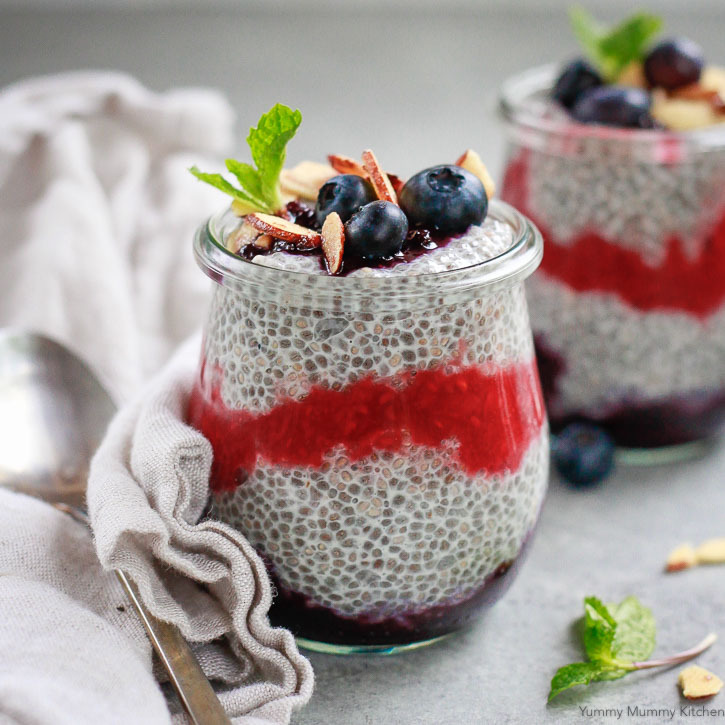 An incredibly delicious and nutritious overnight chia pudding made with almond milk and served with berry sauces. This vegan chia pudding doesn't have any added refined sugars and is a great breakfast, snack, or dessert. 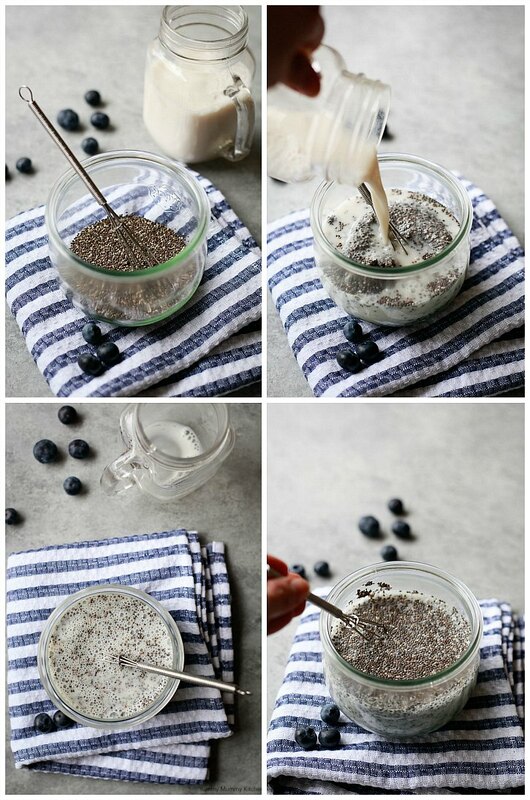 In a quart sized jar or storage bowl, stir together the chia seeds, almond milk, and sweetener. Let sit and gel for about 10 minutes. Stir again, cover and store in the refrigerator overnight. Meanwhile, make the berry sauce(s). Place the berries in a small sauce pan. I used two pans, one for the bright red berries, and one for the dark purple berries, to keep the colors separate, but that's not necessary. Add about 1/4 cup of water to the pan, bring to a low simmer, and cover. Stir every so often and break up the berries with a wooden spoon or spatula. Uncover and let the berries stew until they form a nice thick sauce. Add more water as needed if it dries out. Transfer to storage bowls and let cool, then store in the refrigerator. 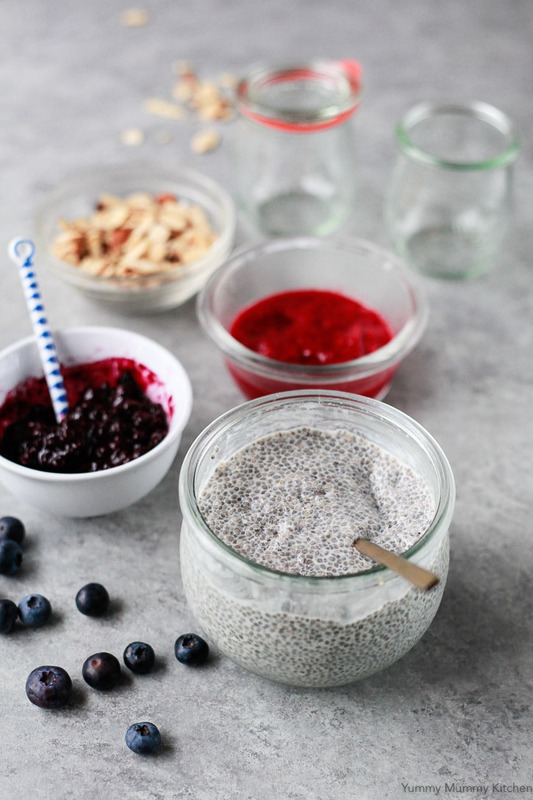 To serve, assemble the chia pudding and berry sauces in layers in jars, or in a bowl. Top with almonds and fresh berries. You can use fresh or frozen berries. Frozen berries are a good choice when fresh berries aren't in season. A splash of maple syrup also works well for sweetening your pudding if you don't like stevia. This looks delicious and so healthy!! These look amazing! What size are the cute little jars you are using to store in the fridge and also the ones you served them in? can you pre-make the jars layered or do you have to assemble in the morning?